This website hosts the audio files which accompany the volumes of the Dialects of English book series. The files are made available free of charge, but are copyrighted and may only be used for the purposes of teaching and research. They may not be copied, further distributed or sold in any form. 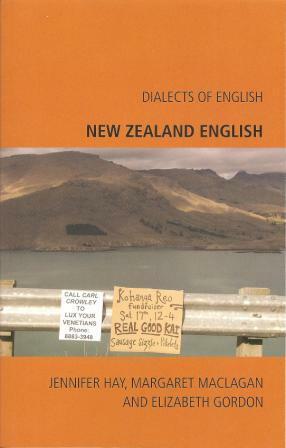 The authors of New Zealand English are Jennifer Hay, Margaret Maclagan & Elizabeth Gordon. The online audio player to the left allows playback of the audio extracts: the relevant page numbers are listed. The audio files are also available in WAV and MP3 format by using the links below. The audio files in section 8.3 are provided with permission of Sound Archives/Ngā Taonga Kōrero (Radio New Zealand). The sound files may not be reused without permission from Sound Archives/Ngā Taonga Kōrero, website: http://soundarchives.co.nz. These files are not available for download, and so are not included in the set below. The recordings are given below in both WAV and MP3 format, which should play on all media players, and the files are downloadable. New Zealand English is a volume in the Dialects of English series; click here to go to the series homepage. To purchase volumes in the series, use the ordering facility on the Edinburgh University Press website, or visit any good bookshop. Click here for the webpage for this volume on EUP's website.